After nearly a year out of print due to the publisher closing its doors, the second romance Lucy ever wrote, Annabelle’s Courtship, is available in digital and print again. Get your copy today! Ian MacKay, Laird of Graenfrae, has no use for love or marriage. However, his stepfather’s will mandates that marriage is what he must have…to an Englishwoman. A sensible man, Ian develops a list of requirements in a wife: Plain, moderately dowered, older and practical. 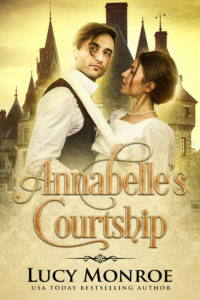 He thinks he has found the perfect candidate in Lady Annabelle. She refuses his proposal. He informs her that she will marry him at the end of the season. Read an excerpt on the book page.